They’re often used interchangeably, but according to Dr. Charlie Grantham, a workplace that supports wholeness will have a lot more mileage than one that merely supports well-being. The last WDM article I wrote concerned the relationship between chakra energy centers and a work environment. It seems that it hit a nerve and I’ve been asked to delve even deeper into the link between well-being and wholeness, concepts that are often confused with one another. So, I begin by exploring the ”why” question. Why should a workplace designer even care about these ideas and their subtle, but important, difference? Why should you, as a workplace occupant, care? The boundary between working and living is disappearing and most people don’t know how to manage themselves, or their teams, in this now seamless environment. The Tayloristic notion that “you leave your personal life at the workplace doorway” doesn’t have any legitimacy in today’s world. This “new normal” is touching almost everyone. Currently, nearly 25 million people work at least one day a week in their home. This figure is growing at about four percent per year, so the boundary between working and living is rapidly disappearing. The boundary between working and living is disappearing and most people don’t know how to manage themselves, or their teams, in this now seamless environment. The workplace is really only an extension of the rest of our life environment. For example, if you are pushing hard on a healthy diet, why should you put that aside when you go to work? If you are really serious, you can’t. For you, the workplace needs to provide healthy eating options. Here’s another example. Exercise is important for all of us. So, how does that blend with where you work? Simply, there can be accessible exercise facilities co-located with work. Or gym membership could be part of your compensation package. Are there paths or sidewalks near your office that are pedestrian friendly, encouraging afternoon strolls? You spend about a third of your life in a work environment. If you’re striving to bring wholeness to your life, it can’t be done only outside of work. It has to be integrated into the total fabric of your life. But what about the larger picture? “Well-being” is the term being bandied about as the large picture idea. But is it enough to be comfortable, healthy, and happy at work? Yes, there are positive business benefits to “well-being” programs — they’ve even been explored in this magazine. But I would offer that well-being and wholeness are different things. Well-being brings you balance in the present. Wholeness pulls you toward the future. I see the concepts as overlapping, but different. I think we need to focus on ”wholeness” as I’ve depicted. Note that I’m not neglecting traditional ideas of well-being such as mindfulness, belonging, and energy balance. I’m adding things that might be termed more social psychological on top of the concepts that concern the individual only. You may notice that I have excluded wealth from the concept of wholeness. Some people may quibble with that, but if the workplace isn’t generating wholeness, no amount of compensation will matter. Money, physical things, and possessions beyond a level of simple physical comfort won’t bring wholeness to your life. Pope Francis and the Dalai Lama certainly are wealthy people in the everyday sense, but they are also living examples of wholeness in the person. The workplace is really only an extension of the rest of our life environment. Presence is also important, in the sense that you know how others perceive you and that you can also be present in the moment. To me your connection to your real life social network (not just the one on Facebook) is part of wholeness. In fact, the structure of your social network has been shown to relate directly to your emotional states. Your ability to express your values also builds trust with your team and reinforces collaborative behavior. In a larger sense, wholeness comes from being in service to others and something larger than yourself. Finally, do you practice what you believe? If the workplace hinders true, open expression, and constrains behavior, I submit it is not contributing to wholeness. So what can workplace leaders do to promote wholeness for their employees? 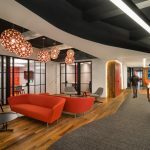 It’s more than designing an attractive, comfortable space; it’s also designing the “social space” of the workplace. The word for this approach is “socio-technical” design and it seeks to jointly optimize technology (which includes the physical space) with the social, or interaction space. Ultimately, this is about taking personal leadership for realizing your wholeness, centered on purpose. The process of realizing wholeness begins with the individual but it also extends way beyond the person into the workplace and the larger community. What is important is that there are no barriers to wholeness in the workplace. Ideally, we will have workplaces in the future that not only have taken down barriers, but also actually promote a commitment to wholeness. The workplace can provide a container to do this for those who are seeking it. Previous articleWhat is Our Role in Shaping the Future of Work? Next articleWhat Shapes a Whole Workplace? Check out the 360 magazine by steelcase that has some good research in this area.